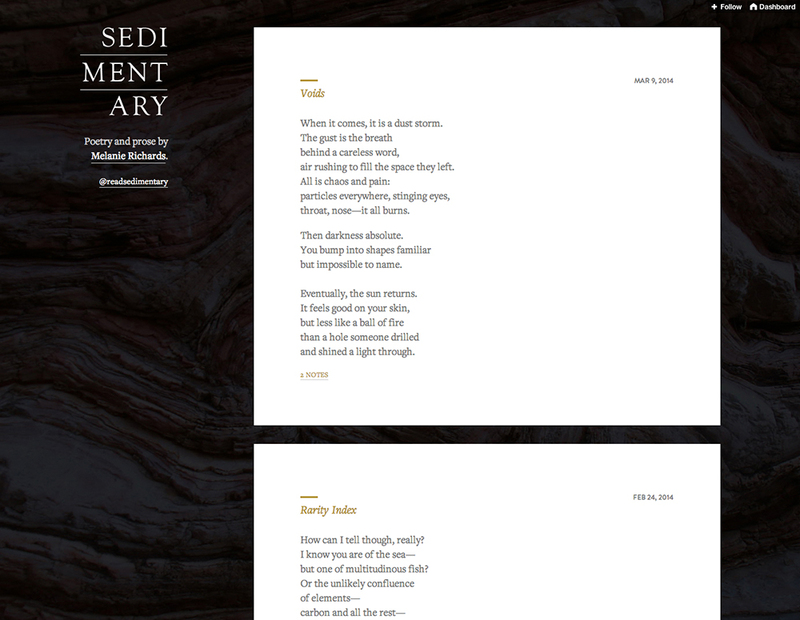 My poetry and prose blog, Sedimentary, is now responsive! It’s actually the most basic layout ever—just post stacked on top of post—but the CSS hasn’t seen any love since four-ish years ago. I’d like to start writing more fiction, so I thought it might help with motivation to do some spring cleaning: changing to wide posts from columns to support longer-format writing, Freight Text’ing it up, and actually buying a domain name. If you’d like to follow my writing blog in all its melodramatic glory, it’s hosted on Tumblr and is connected to a Twitter account (@readsedimentary).